36th Infantry Bn, The Machine Gun Corps, 36th Division, B.E.F. 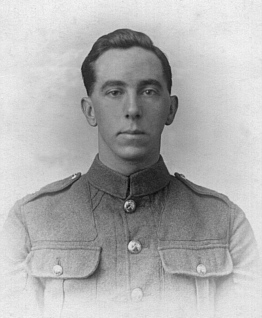 Allan Knowles joined the Worcestershire Regiment in June 1915 and later transferred to the Machine Gun Corps. It is likely he did not serve overseas with the Worcestershire Regiment as he sent postcards home from a training camp in Lincolnshire, which is very likely to be Grantham – the home of the Machine Gun Corps and from where new units were trained. Had he have served with the Worcestershire Regiment abroad, it is likely he would have transferred to a Machine Gun unit in the field and not have been trained at Grantham. His story featured in the Malvern Gazette and Ledbury Reporter on Friday, 25 April, 1997 – following a Dyson Perrins C.E High School history trip to the First World War battlefields. The party included Cpl Knowles’ great grand-daughter, Rosie Davies, who was the first member of the family to visit the grave, although the family were sent a photograph of it soon after the end of the war. As the paper reported, it was an emotional moment, not just for Rosie, who fifteenth birthday it was on the day of the vist, but also for the pupils and teachers. He is buried at Dadizeele, the village which was reached by the 36th (Ulster) Division (to which Knowles belonged), and taken by the 9th (Scottish) Division, on the 29th September 1918, after remaining in German hands during almost the whole of the War. Dadizele New British Cemetery is in fact an extension of the Communal Cemetery. It was made after the Armistice by concentrations from other burial grounds and from the battlefields of 1918 (there are a few 1914 graves in plot VI, row D). The graves are mainly those of the 36th, 9th and 35th Divisions. There are now over 1,000, 1914-18 war casualties commemorated in this site. Of these, over 150 are unidentified and special memorials are erected to seven soldiers from the United Kingdom, known or believed to be buried in the cemetery. Other special memorials bear the names of three soldiers from the United Kingdom, buried in German cemeteries, whose graves could not be found.